Are you wondering what it takes to properly clean grout without harming tile surfaces? Whether you’re trying to do it yourself or hire a grout professional to do it for you, these grout cleaning FAQs will help give you a general idea of the best techniques and methods. Should I Use a Machine or Hand Wash Grout? It all depends on the job. In some cases, hand scrubbing wouldn’t be sufficient to clean grout, calling for specialized equipment designed for tile and grout cleaning. The Grout Medic uses devices equipped with vapor technology to get the best results each time. Why Professional Grout Cleaning Works Better than My Hand Cleaning? Some homeowners have tried cleaning their own grout for many years, but can’t achieve the results they want. When you hire a professional grout cleaning service, it’s the combination of professional-grade equipment, products and knowledge that result in surfaces returning to like-new condition. Is it Possible to Return Blackened Grout to its Original White Color? With the assistance of a professional grout cleaning technician, it is possible to restore blackened grout back to its original white color. It may depend on how long the grout has been dirty, the materials involved and the date of the last sealing (if it was ever sealed). How Do I Keep Grout Clean After a Professional Grout Cleaning Service? Once your grout has been professionally cleaned, a technician can seal it. Sealing will help your grout resist stains and contamination in the future. Can My Large Show Room Receive Grout Cleaning? If you’re worried that your show room is too large, think again. 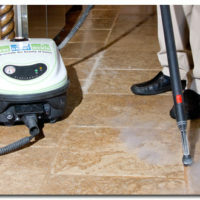 We use the latest technology that enables us to clean grout in rooms of all sizes. So whether you need an ordinary kitchen floor cleaning or a touch up on a large show room, we have the capacity to do so. Are you interested in restoring your tile surfaces with professional grout cleaning? Contact The Grout Medic today for a free quote! Call 1-866-994-7688.